A World of Creative Possibilities: SugarPea Designs: Sweet2Repeat blog hop! 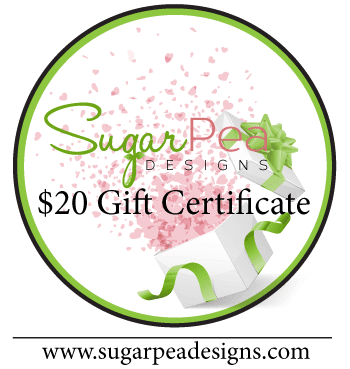 SugarPea Designs: Sweet2Repeat blog hop! Ouf, what a week it's been! And I'm back today for a very Sweet2Repeat blog hop edition with the latest release at SugarPea Designs! I am definitely not lying when I say that this is a favourite release of mine, full of coverplates, solid stamping and cute sentiments. I used multiple items from the release on my card: the Topiary Garden stamp set, the Sympathy SugarCut, and the large striped coverplate, along with one of YOUR favourites, the Spots & Stripes Pastels pattern paperpad. Not only are good Sympathy sets VERY rare in crafting, but die-cuts are must-haves! And you definitely want to head over to the SugarPea Designs blog for a chance to win some prizes! The topiary garden set is a must have on my list! A pretty card, I love the topiarie's and the fab colors you used on them. A perfect sympathy card. This is very pretty! I love the soft colors! Sympathy cards are always so hard to make.. but I love this card and idea. You could use this design for anything but I love the idea of sympathy. Thanks for showing this possibility. Pretty topiaries and I like the striped background. Love the topiary garden and your great background. Great design and perfect for any occasion. What a wonderful set the topiary trees are. Both cards are so lovely. Great idea for one of those difficult sympathy cards, Stephanie. Thanks for sharing! The SPD stamp set you used is truly fantastic and the images look beautiful in your design!! Love your card, that sweet is super cute! I love the topiaries. I agree with Billie. Sympathy cards are not easy to make. You want your sincerity and respect to come through your design. This is appropriately done, and quite beautiful. Wonderful Sympathy card! Very beautiful! Lovely card! I love that stamp set. What a beautiful sympathy card!! Such a sweet card! I love the stripes! sentiment in both black & white. You did a great job on this sympathy card...always hard to make. Beautiful card! Love the CoverPlate you used and those lovely topiary trees! Pretty colors! Beautiful card! I like the soft colors you used. What a sweet card! I love your topiaries; so pretty! Beautiful and sweet color combo in your card, super pretty!